Try One of the Most Popular Turbulence Training Workouts for Free…and Find Out the Hidden Dangers of the Dark Side of Cardio and Other Over-Rated Fat Loss Methods. 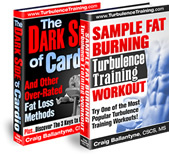 A free copy of a sample Turbulence Training workout. My controversial report about why cardio is sabotaging your fat loss effort. And a free subscription to my weekly Turbulence Training email newsletter where I’ll share with you my insider secrets on how to burn belly fat and boost your metabolism… without spending hours in the gym.